• الموضوع : Dr.Mohamad Ali El Husseini meets Bishop Camilo Palin and emphasizes the need for a joint meeting between the heavenly religions . 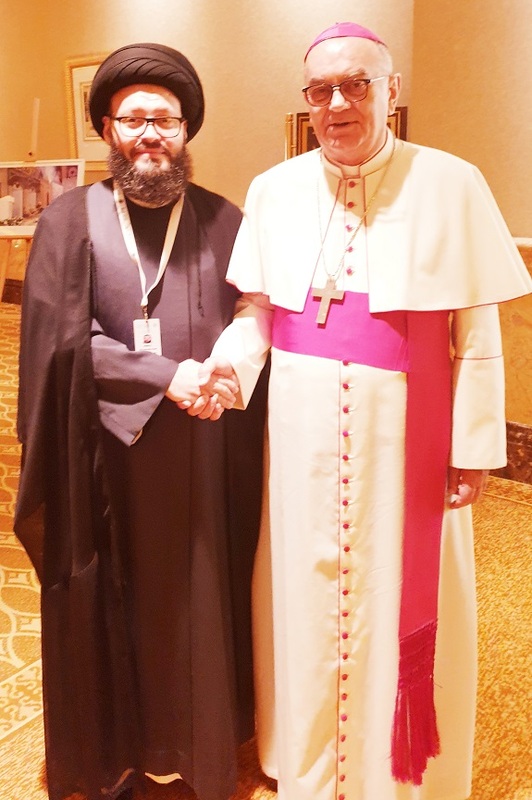 Dr. Mohamad Ali El Husseini, met with the Apostolic Vicar of the northern Arabian Peninsula, Archbishop Camilo Palin, where he stressed the importance of the joint meeting between the symbols of the heavenly religions. During a meeting with Bishop Kamilo on the sidelines of the Humanitarian Brothers Conference in Abu Dhabi, El Husseini affirmed that the message of Islam and Christianity calls for spreading the values ​​of love and tolerance among all creatures. He pointed out that what combines Islam with Christianity is the Quranic commandments which affirm it as a strong relationship based on affection and mercy. The closest of affection to those who believe, who said that we Christians that they are priests and monks and they are not proud.